When I met David Weinberger in person last month at his Harvard talk with Doc Searls and Jonathan Zittrain about Cluetrain, I told him something along the lines of “I’ve been enjoying your blog for as long as I’ve been reading blogs.” And that’s true. I’ve been reading Weinberger, and — probably more interesting to me — listening to any conference talks of his that I find in audio form when I can. Weinberger is one of those first bloggers I started following when I got into all this just a few short years ago. Anyway, the point is, I pay attention when he gets all philosophical. There’s a lot of Dan Gillmor in that, I thought, and I’d love to hear more about what he means. Today I read Weinberger’s post that extends his “X is the new Y” cliché into something much more meaningful. In other words, Show Your Work. If transparency is the new objectivity, it has to go deeper than disclosing conflicts of interest. Transparency on the Web is all about disclosing how and where you found the information you’re passing on to the next person, or readers, or audience, or community. It’s at the heart of the blogosphere’s “via” links. It’s at the heart of sourcing the facts of your story. Related: Matt Thompson steps over the corpse of objectivity and writes a eulogy for “the news voice” itself. What was the news voice? And finally: A link to more links. Kevin Sablan links to Weinberger’s piece on transparency/objectivity and adds a list of four more links to the canon. Click, then click again. Read them all. Save them for yourself, share them with others, or follow the trail backward to see where the ideas got their start. The odd thing about being both a blogger and a journalist — on this particular day — is reading a story in the newspaper that I wrote about BlogHer, in which I try to play reality against what the big bad mainstream media (which is now apparently me) would have us believe is the stereotypical blogger. Over at The Internship That Shall Not Be Named, I wrote a story about BlogHer. At one point in the process, I had written the lead that ended up in another paper’s article about the Pew study. I decided to bury the stereotype a little deeper, and tag it as such, instead of just throwing at the reader first thing. Maybe we should do that more often, eh? And now I’ve gotten myself in trouble with a(nother) possible future employer. Cross that one off the list. Great. Thanks to all the BlogHers who let me prod them with questions, including the ones who didn’t make it into the story due to space constraints. Yes, I am aware that there are no limits on screen space online, but editing a version of the story for each medium isn’t exactly in play where I’m at. For your enjoyment, here’s my short literature review on The Nature of News. Lippmann saw the news media as a searchlight scanning the landscape, its beam too narrow to put what it shines on into context. The interpreters of events, the span of their searchlight limited by time, space, and convention, use stereotypes to fill in the gaps. Like mythic archetypes woven into the structure of storytelling, these stereotypes are intended to be broadly comprehended. These should be the lowest common denominators that hold a society together. Unfortunately, these shortcuts tend to reinforce the status quo. By performing this function, the news media is unintentionally proving Klapper’s 1960 limited effects hypothesis. 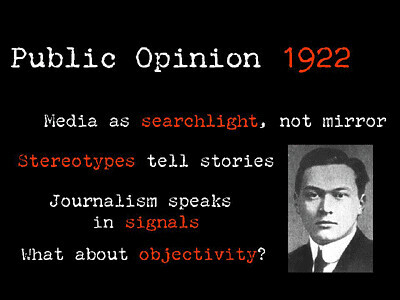 I’m not going to go at length about the End of Objectivity, or even the perils of objectivity, although I should get around to posting a little literature review and presentation I wrote on the topic awhile back. I wrote this story on the immigration issue for today’s Spartan Daily. I talked to faculty from history, political science, and social science. I talked to a few students whom I thought might be Latino (they were), and a few who I figured weren’t (they weren’t). And there I was, with a story totally devoid of anyone backing HR 4437. What was my obligation? My editors wanted a voice in there to state the case, but as the day went on, even the Republican leadership in Congress backed off from the whole “illegal immigrants = felons” part of the bill. So, I put in a few calls to U.S. representatives from California who had sponsored or voted for the bill. No dice, no calls back, no one who could give a statement. Next thing I tried was a conservative group on campus – they thought the legislation was the wrong way to try and solve the problem. If the story wasn’t already up over 800 words, I probably would have thrown a quote from them in the story, but I still didn’t have the counterpoint needed. What would you do in this case? Would you seek out a fringe group that you KNEW would give you a useful quote? The media relations guy picked up his cell phone after a couple rings, then politely answered my questions with a nice long statement on the issue, giving me the “illegal immigrants = felons” bit, plus blaming all involved governments for the problem. What’s the right thing to do? Should I have asked my editors to hold the story until I got in touch with one of our Reps, or was the Minuteman interview good enough? Should I have walked around campus until I found students who thought deporting 12 million immigrants is a good idea?